It’s a great time to buy the S.H.Figuarts toys on Amazon at the moment. They have the pre-order Krillin for $40 and now they have the recently released but very hard to find Saiyan Saga Vegeta for less than $50. The Saiyan Saga version of Vegeta is the one fans wanted from the start. It has his signature Frieza armor along with the icon scouter from his first appearance. We first saw this Vegeta at one of the conventions with a Nappa prototype but so far it looks like the Nappa might have been just for display. 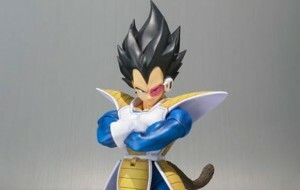 On his own Vegeta still looks pretty cool and may be a very limted release for this version. From personal experience Amazon has been the cheapest place to buy all the Figuarts toys so far as they order them in bulk and sell at a reasonable retail price.